DINE REWARDS - Get $5 or $10 off your next meal by just signing up!!! A great way to earn money while you dine out. 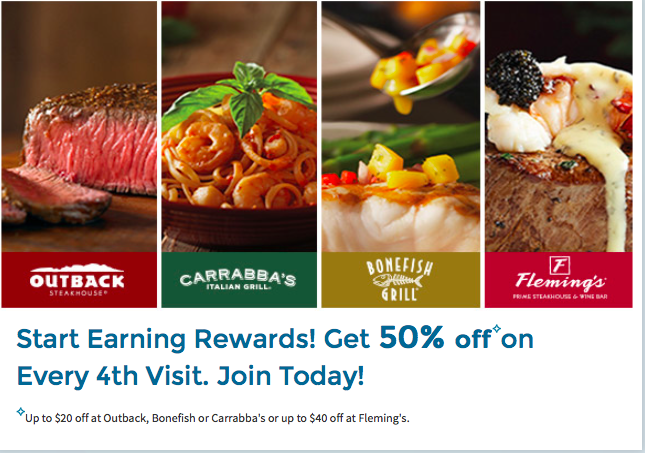 Upon signing up you will get a $5 off welcome bonus that can be used at any of our participating locations, across any of our restaurant brands: Outback Steakhouse, Bonefish Grill or Carrabbas’s Italian Grill OR; $10 Fleming’s Prime Steakhouse & Wine Bar.